…a ghostly funeral procession haunts a former French outpost on the Mississippi? In 1718, Illinois existed as a territory under French rule. The French wanted a military stronghold in the vicinity from which to rule, so they decided to build a fort near the Mississippi River at Prairie du Rocher. Preceded by two wooden forts of dubious construction, the stone Fort de Chartres was built in the 1750s, with several buildings inside a great outer wall. France lost the Seven Years’ War in 1763, ceding much of its land to the British, who took over Fort de Chartres in 1765. They abandoned it in 1771 due to lack of interest and still further deterioration. Fort de Chartres languished in ruin for over a century. Once the south wall collapsed into the Mississippi in 1772, nearby homeowners stole building materials from the inner buildings, as well as the wall itself. By 1900, only the powder magazine was left. In 1913, however, the site was snapped up by the state, and reconstruction began. 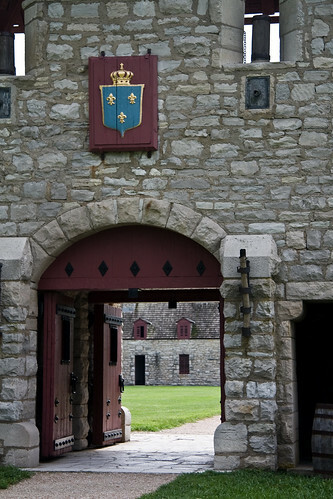 Today you can visit Fort de Chartres in all its eighteenth century glory; the grounds house a museum, the original powder magazine, a chapel, guards’ quarters, and more. Several family-friendly events take place throughout the year. One event that might not be so family-friendly – or friendly to anyone living, for that matter – is purported to take place on the 4th of July, as long as it falls on a Friday. (Go figure.) Rumor has it that a prominent local businessman, or possibly a British officer, was murdered by a French soldier. Secrecy demanded that the deceased be buried at midnight in a cemetery outside of town. Supposedly, if you’re in the area on Friday, July 4 between eleven o’clock and midnight, you’ll see the 40-wagon procession wind down the same road it took so many years ago. The last chance for that happenstance was in 2008, but sadly I was not there. Did you see anything untoward come toward you that night? I recently learned of this place from a book I picked up called Haunting Illinois. I heard about it a few years ago, but couldn’t remember the name, only that it was French. for some reason I thought it was straight west; it’s near St. Louis/Alton instead. Yeah, it’s a bit south. Alton gets a lot of the paranormal fun outside of the city, it seems.